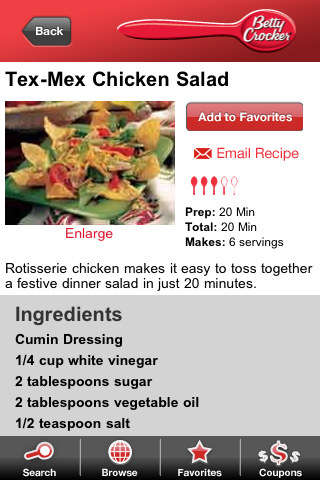 Fine dining it ain’t, but for decades now, Betty Crocker has played kitchen muse to millions, so it’s only fitting that she should bring her culinary talents to the App Store. For the frugal home cook, this totally free cookbook is quite the generous offering, if you can overlook a few particular quirks. Although the recipes aren’t terribly strong on pictures or instruction, there are a lot of them. You can either browse through by category or simply search for particular recipes if there’s something you had in mind, although I found the search function to be very slow. Other features include an area to save favorite recipes, just like a digital recipe cardbox, and there is also a coupon section with special offers on affiliated products. The coupon offerings are rather scant and mediocre, which was rather disappointing, especially after waiting an age for the page to load each time. It’s impossible to overlook how keen the cookbook is on pushing specific products, since there’s even an entire category dedicated to General Mills cereals, but at least most of the recipes do not demand particular branded products. One feature I was severely disappointed in was the “Meal Finder” search. In theory, you would input a couple of ingredients you hand on hand, tell it what kind of meal you’re looking to make, and it selects some appropriate recipes, but in practice, this feature was dysfunctional to the point of worthlessness. For example, inputting “eggs” and searching in “Breakfast/Brunch” gave me absolutely nothing, although I certainly found plenty of omelette and frittata options while browsing. Meal planning in general is mostly nonexistent, which is unfortunate, as I would have loved the ability to select particular recipes and have the app generate a grocery list for me, but this is really just a barebones digital cookbook, without any bells and whistles. It’s a lot more convenient than lugging around a physical book, but it certainly didn’t wow me. Still, for the price and the number of recipes included, I really can’t complain. One final thing to keep in mind is that while this is a handy resource for the established home cook, it’s a terrible resource for people new to cooking. Recipes do tend to be on the simple side, but directions are equally spare, so unless you have a good idea of what you’re doing, it’s a bit of a crap shoot. But if you’re in the kitchen a lot and have a taste for good, old-fashioned American-fare, Betty Crocker’s got you covered. AppSafari review of Betty Crocker Mobile Cookbook was written by Tracy Yonemoto on August 20th, 2010 and categorized under App Store, Books, Food, Free, Productivity, Reference. Page viewed 4192 times, 1 so far today. Need help on using these apps? Please read the Help Page.